Our resort, Palma Real is a small, quiet, beautifully landscaped community of homes. This is a very pretty, quiet place to vacation but at the same time a short 10 to 15 minute walk gets you to the best beaches, restaurants, shopping and nightlife Aruba has to offer. Our townhouse is a very comfortable, well appointed home away from home. Everything you'll need for a comfortable stay and more is located within this home and the small, quiet resort of Palma Real. We often explain to people that when we're in Aruba, about 4 to 5 times each year, we want all of the comforts of home and so our guests enjoy all of the same amenities. 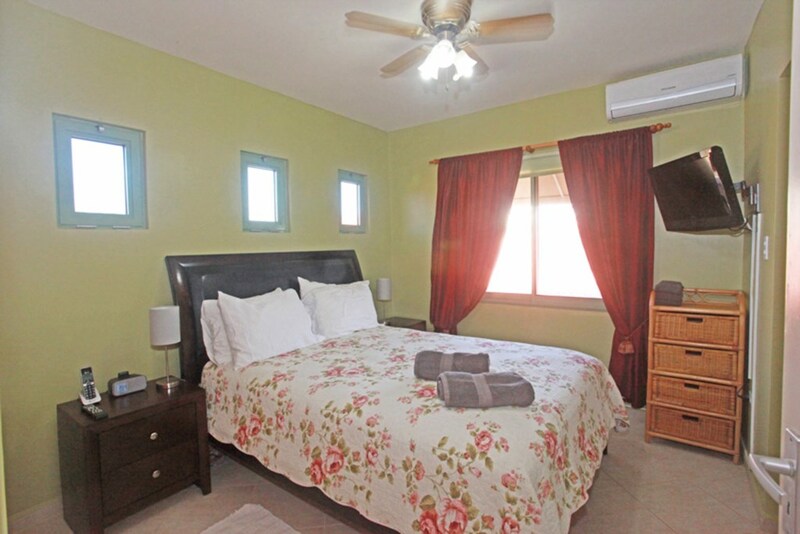 The townhouse boasts 2 master bedrooms with a full en suite bath in each. The third bedroom is on the 1st floor and there is also a full bath just across the hall. We are just a 10 to 15 minute walk from Palm Beach itself and a little further to Eagle Beach but if you'd rather not take your car then you can get to the beaches, shopping or restaurants even faster with the use of the 4 bikes (with helmets) we keep at the townhouse for guests to use free of charge. If you want to explore the island, you might choose to sign up for one of the great island tours or reserve a car or Jeep from one of the rental companies close by for a day or two. Otherwise, just walk, use our bikes or the local bus service and save the rental car costs!!! Free calls to and from the USA and Canada. We keep a phone in the townhouse that you can use to make and receive phone calls to the U.S. and Canada...... and it's FREE!!! As I said the townhouse has all of the comforts of home: Cable TV and high speed WiFi. Free telephone calls to and from the USA and Canada. 4 bikes (with helmets) for our guests to use. 3 pools within the community (including the kiddie pool). 3 bedrooms and 3 full bathrooms - sleeps 2 to 6 people in comfort. Of course all of the utensils, pots, pans, plates, glasses, silver and cutlery are available for your use. Also, our management company is very close by and so if you have any problems, they will get them resolved. We checked before we hired them; they're the best management company on the island and they're committed to taking good care of our guests in Aruba. Be sure to take a look at our reviews. We're very proud of our guest reviews and we strive to provide our guests with a wonderful vacation in this great little resort. This rental includes the 15% tax / service charge, final cleaning, bookings fee, an allowance for water and electricity for the amount of US$ 15,- per night and wireless internet. Extra usage will be at your own expense. Upon arrival a refundable security deposit is required of US$ 400,-. Palma Real was an excellent place to stay. It was very close to everything we wanted to do. It was well appointed, clean and tidy. The Aruba Happy Rental agents were friendly and accommodating. The description of the property is fully accurate. Loved #20 Palma Real ! Perfect for our family of 5. The owners helped a lot with dining recommendations. Great value for the price - highly recommended.